Albert Adomah and Keinan Davis spurned early chances for Villa, but the Lions fought back and threatened themselves. Jed Wallace forced a good save from Sam Johnstone with a low shot and Lee Gregory struck the crossbar from a tight angle and glanced a header wide. Villa managed just one shot on target, but a point kept them fifth, six points off an automatic promotion place. Millwall have not won away from home in the Championship this season, but created the better opportunities and looked the more likely to take three points. Gregory was a constant threat and Steve Morison tested Johnstone with a volley from the edge of the box. 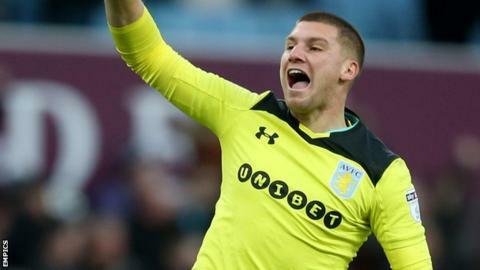 But Neil Harris' side could not find a way past Villa's keeper, and missed out on what would have been their first back-to-back Championship wins since August 2014. The draw left Villa in fifth place as Derby climbed above them by virtue of their 3-0 win at Barnsley, with Millwall 17th. "I have to be honest, it was a struggle against a very decent Millwall side who put us under pressure. We'll take a point. "We didn't have enough control and found it difficult. We have to play better than that. "Sam Johnstone was easily our best player and he had to be but I'm really disappointed with how we played today. "We gave it away too often and we looked sloppy and lethargic. There's no excuses for that. Overall I got it wrong with my changes." "I was delighted with my players' performance from the first whistle to the last. "I thought we unsettled a really good Aston Villa side and quietened a passionate home crowd. I think we dominated large parts of the game and limited Villa to very few chances. "We were creative going forward and I think we are at a stage now where I can be a little bit critical, saying 'we want more'." Match ends, Aston Villa 0, Millwall 0. Second Half ends, Aston Villa 0, Millwall 0. Corner, Millwall. Conceded by James Chester. Tom Elliott (Millwall) wins a free kick on the left wing. Tom Elliott (Millwall) wins a free kick in the defensive half. Corner, Aston Villa. Conceded by George Saville. Attempt blocked. Josh Onomah (Aston Villa) with an attempt from the centre of the box is blocked. Jake Cooper (Millwall) is shown the yellow card for a bad foul. Keinan Davis (Aston Villa) wins a free kick on the left wing. Substitution, Millwall. Shaun Williams replaces Aiden O'Brien because of an injury. Corner, Aston Villa. Conceded by Jake Cooper. Hand ball by Jack Grealish (Aston Villa). Attempt saved. Lee Gregory (Millwall) right footed shot from the centre of the box is saved in the centre of the goal. Assisted by Steve Morison with a headed pass. Attempt saved. Lee Gregory (Millwall) header from the centre of the box is saved in the top centre of the goal. Assisted by Jake Cooper with a headed pass. Substitution, Aston Villa. Tommy Elphick replaces Christopher Samba because of an injury. Delay in match Christopher Samba (Aston Villa) because of an injury. Lee Gregory (Millwall) hits the bar with a left footed shot from the left side of the box. Assisted by Steve Morison following a fast break. Attempt blocked. Jack Grealish (Aston Villa) right footed shot from outside the box is blocked. Assisted by Keinan Davis. Attempt missed. Keinan Davis (Aston Villa) left footed shot from the centre of the box misses to the left. Assisted by Neil Taylor with a cross. Corner, Aston Villa. Conceded by Aiden O'Brien. Substitution, Aston Villa. Ahmed El Mohamady replaces Alan Hutton. Jed Wallace (Millwall) is shown the yellow card. Jed Wallace (Millwall) has gone down, but that's a dive. Corner, Aston Villa. Conceded by Shaun Hutchinson. Attempt blocked. Josh Onomah (Aston Villa) right footed shot from outside the box is blocked. Assisted by Keinan Davis. Attempt blocked. Lee Gregory (Millwall) right footed shot from the centre of the box is blocked. Assisted by Ryan Tunnicliffe. Corner, Aston Villa. Conceded by David Martin.